Preconceptions are great aren’t they? We all have them … and I had them in spades confronted with this new set. Sometimes it’s my custom when reviewing to read through background material provided before I begin to listen. At other times I’m inclined to slip the discs in the machine without looking at any of the notes, other than just enough to get my bearings. I took the latter course on this occasion … and did I come to the wrong set of conclusions! I began with disc 1, Symphony No. 1, and then proceeded through the discs in sequence. The more I listened the more convinced I became that Anissimov and his orchestra had recorded these works in order of composition. Whilst I didn’t dislike the performance of the First it seemed somehow tentative to me; not fully formed … as though the artists were coming towards an understanding of the idiom … but hadn’t quite got there yet. To be frank the finale, one of my key testing points for any Rachmaninov cycle, paled against Ashkenazy and the Concertgebouw (Double Decca 4481162). True few if any interpretations can live with the older Russian and his Dutch orchestra in this classic performance; quite riveting in execution and splendidly recorded. Despite some decent playing and sound, to be honest, Anissimov and the Irish players are incinerated in its wake. Symphony No. 2 however showed distinctly more progress, and despite some cuts (and no 1st movement exposition repeat) there seemed to be more confidence. Moreover taking Ashkenazy again as a comparison, the older Russian loses some ground here with a rather unsympathetic interpretation of the lovely slow movement. By the Third Symphony everything in the Naxos recording seemed to be in place. Whilst there was still a tendency to a relaxed approach to tempos, even to linger overmuch here and there, the habit seemed much more integrated into the conception … indeed the orchestra appeared beguiled into some deft and beautiful playing and phrasing. But … oooops! … one look at the notes, and it confirmed almost the complete opposite in terms of the sequence of recording. True the time margins were not great; the whole enterprise being completed in just under a year … yet there it was in black and white: Symphony No. 3 was recorded first, followed shortly by number 1, and then after a gap of approx 11 months came the 2nd. (The Symphony, vol 2, “Elgar to the present day”, Penguin 1971). The story of the first performance is important enough to bear repetition. It was directed at the Moscow Conservatoire in 1897 by Glazunov. The older composer seems to have tackled the task with marked incompetence, allegedly due to drunkenness. Certainly in later life (the 1920s) Glazunov’s liquor problem was marked – if Solomon Volkov’s “Testimony” is any guide. Yet his mismanagement of the music may not have been driven by a particular antipathy to the score … whereas Glazunov’s friend Cesar Cui made it quite clear he was bitterly opposed to his younger colleague. 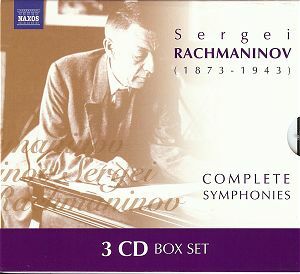 His review, including the remark that Rachmaninov had attempted to “depict in music the seven plagues of Egypt” did at least as much harm to Rachmaninov’s fledgling symphony as any musicianly scramble at the premiere … probably more. Rachmaninov, his confidence severely dented, eventually sought the help of the hypnotherapist Dr Nikolai Dahl, who helped him regain his compositional confidence, and eventually his triumphant return to the concert stage with his 2nd Piano Concerto. It was roughly at the point of this triumph that Rachmaninov promised Alexander Siloti a new symphony, although it was to take some six years to come to fruition. Dominated by a strong lyrical feeling, it also makes extensive use of the Dies Irae as an idée fixe. As I remarked earlier I felt Anissimov and his orchestra seemed in greater sympathy with Rachmaninov here, although the 1st movement exposition repeat isn’t observed. To be fair it isn’t included very often, and I can enjoy the work without it, although it isn’t my preference. Incidentally he resists the temptation to end the first movement with a pronounced timpani thwack. However move on to the scherzo (placed second) and try the first few minutes to get a view in microcosm of the conductors approach. After the initial galloping theme on the strings and horns at approx 1.25min we slow down for a contrasting subject….and we do slow down. Again Ashkenazy isn’t that much quicker, but there is more sense of forward motion. Anissimov lingers just that little bit more. By the third symphony my caveats tended to wilt beneath feelings of sheer enjoyment. Here and there I registered a minor annoyance at phrases played too quietly (the conductor does insist upon … and get … some very quiet playing at times); for instance at around 10:30 into the finale the little answering phrases, in violins and horns, to the violas interjections are virtually inaudible. But frankly there was so much delicate and beautiful playing that I eventually succumbed to Anissimov’s view. The “fillers” in the set do not affect the issue much either way. The 2nd symphony has nothing; the Third has orchestrations of two piano works – attractive but slight. The 1st is paired with an interesting rarity, the Caprice Bohémien, which has attracted little attention from the record labels. After a long brooding opening the music develops into an attractive characteristic dance. Not a key work but well worth hearing. In all: Naxos are up against it in the Rachmaninov symphony stakes, with plenty of competition from sets (several at super-budget or near super-budget price), plus a number of interesting separate discs. Yet I don’t think the casual purchaser of this set would be disappointed. I’ve heard better 1st symphonies, but would (and will) hear Anissimov’s 3rd again … frequently.